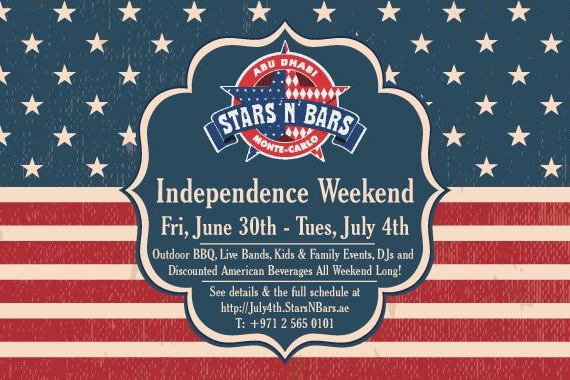 Stars n Bars are catering for the full family with children under 10 eating for free all weekend, and will also be offering a discount on North American Beverages All Weekend Long for the grownups. Weekend festivities run from Friday, June 30th until Tuesday, July 4th. The Party starts at 9pm with The Shakedown! This 5 piece rocks the crowd from 9pm till 1am with popular hits, classics and sing-a-longs. Complimentary drinks for ladies from 10pm to midnight. It’s a Family Day Gala with Face Painting, Magicians and Balloon Art from 1pm till 4pm. Kids under 10 years old EAT FREE when you make a reservation from 11:30am till 6pm. The Return of Karaoke! Sing your heart out on stage to your favourite songs from 10pm till 2am. Get a free shot from the bar with every song sung and earn prizes for best performance. STEAKCRAFT Mondays – Every Monday from 5pm is dedicated to those who love Steak & Craft Beer. Get a NY Strip Steak and any bottle of craft hops for just 105AED. All craft hops are 30AED with the purchase of a steak. On American Independence Day we’re kicking off the night with a classic American themed Pub Quiz, Beer Pong and Flip Cup tournaments. The Band starts at 10pm and goes until 1am then it’s DJ Random Synergy playing popular American tunes until close.